People choosing a career have a lot of information available, but almost all fits in only a few common categories. One is personality assessment, which they can use to find which careers fit their emotional makeup. Another is the tactics of job-hunting, about interviews, résumés, where to look for work, and how to deal with hiring managers. There are any number of “best jobs” listings, all of which present only today’s situation: current pay, current demand, and current working conditions. What will happen with specific work opportunities, though, over the next two decades, after which most of today’s new college graduates will not have even reached what is currently called middle age? Choosing a Lasting Career: The Job-by-Job Outlook for Work’s New Age takes a shot at answering that question. It starts by demonstrating that while the jobs crisis is permanent and will not end with better economic times, careers will not be affected uniformly. The book then presents a comprehensive set of factors likely to affect how work opportunities will fare over the next two decades, including a list of 20 general principles. It provides an extensive series of tables, including its own “Best Jobs” listings, which use criteria important to some people but not others such as compatibility with a family life and outside projects, so the reader can see at a glance which might be most personally suitable. About one-third of the book is dedicated to a comprehensive catalog of 506 different jobs, the most common 502 tracked by the Bureau of Labor Statistics and four others probably prominent in the future, each rated in 11 different future-leaning categories. It also considers self-employment as it actually is, and describes a series of spectacular events in progress or arriving soon, which will not only affect careers profoundly but have the potential to obliterate them completely. Choosing a Lasting Career fills two critical gaps. First, it answers the question of what job or career you should opt for if you already know what suits you and are grounded in the strategy and tactics of being hired. No other book fits better on a shelf between Sweaty Palms and What Color is your Parachute. Second, it improves on the present-only orientation of other career guidance materials by daring to look, specifically and incisively, at years beyond the 2010s. It is valuable not only for those seeking career opportunities after graduation, but for others who want to invest their time and money in a long-term position that will not be swept away by automation, globalization, efficiency, or other factors we cannot ignore. 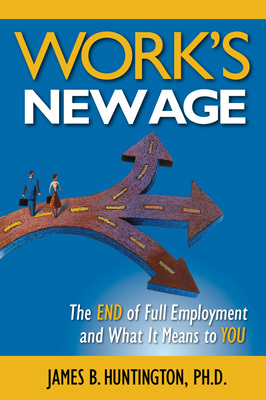 If forewarned is forearmed, anyone’s job- and career-seeking arsenal will be much strengthened by this book. Choosing a Lasting Career: The Job-by-Job Outlook for Work’s New Age by James B. Huntington. Original edition. 8½ x 11, 192 pages, 29 figures. ISBN 978-0-9835006-7-4. $14.95.